Amara turns 6 today. 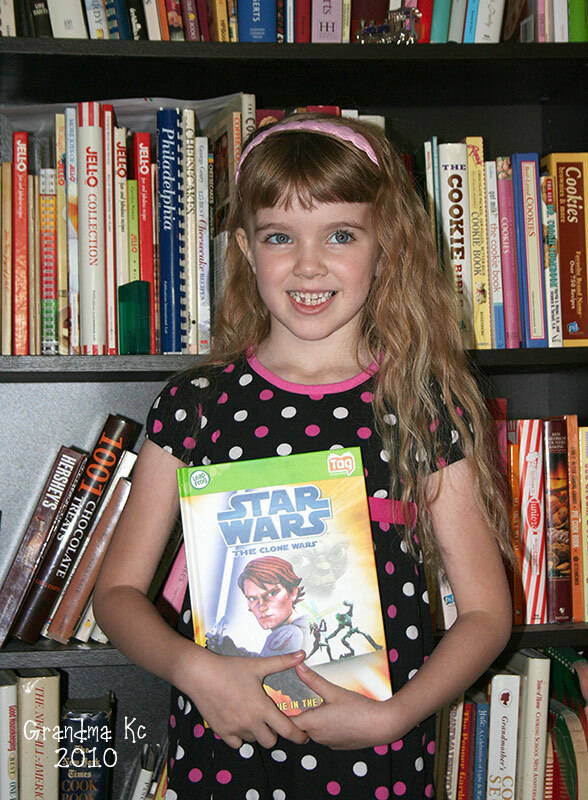 Of course she would have a Star Wars book in her hand! The big party won’t be until Saturday but I really wanted to capture the moment. There will be lots more stories and pictures then. Happy Birthday Marzie! Grandma loves you. This memory was posted in Previously on Amara, Special Occasions and tagged birthday, Grandma, reading, Star Wars on April 21, 2010 by Grandma Kc. She looks so grown up! It really does seem like she has grown a lot more this year than others. But I have to say I think the shorter bangs make her look younger! You’re right, Kc .. it does seem like she really grew up fast this past year! Can’t wait to see the party pictures!!! What a cute page! I’ll bet Amanda and her family love that you are doing this. She loves having me read the stories to her!